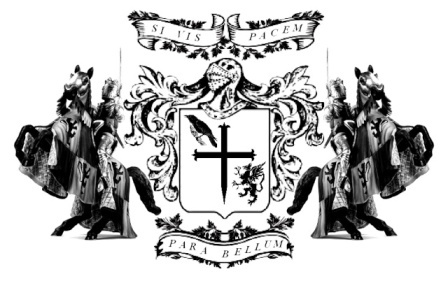 Gladius is a Latin word for sword. 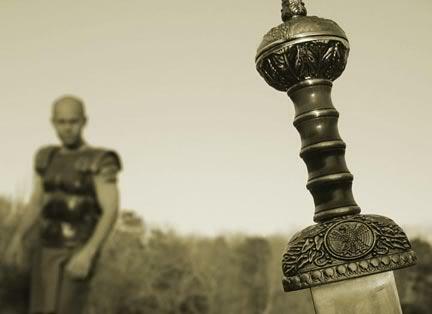 Early ancient Roman swords were similar to those used by the Greeks. From the 3rd century BC, the Romans adopted swords similar to those used by the Celtiberians and others during the early part of the conquest of Hispania. This sword was known as the Gladius Hispaniensis, or "Hispanic Sword." It was once thought that they were similar to the later Mainz types, but the evidence now suggests otherwise. Rather, these early blades followed a slightly different pattern, being longer and narrower, and were probably those that Polybius considered good for both cut and thrust. Later extant Gladii are now known as the Mainz, Fulham, and Pompeii types. In the late Roman period, Publius Flavius Vegetius Renatus refers to swords called semispathae (or semispathia) and spathae, for both of which he appears to consider gladius an appropriate term. A fully-equipped Roman soldier was armed with a shield (scutum), several javelins (pila), a sword (gladius), probably a dagger (pugio), and perhaps darts (plumbatae). Conventionally, the javelins would be thrown to disable shields of enemies before engaging the enemy, at which point the gladius would be drawn. The soldier generally led with his shield and thrust with his sword. All types of gladius appear to have also been suitable for cutting and chopping motions as well as for thrusting. The name is a Latin o-stem noun, its plural being gladii. Gladius is used in literature as early as the plays of Plautus (Casina, Rudens). Words derived from the word gladius include gladiator ("swordsman") and gladiolus ("little sword," from the diminutive form of gladius), a flowering plant with sword-shaped leaves. Origin of the word can be derived from the level of weapon finish technology (smooth finishing) in ancient Indo-European languages : Proto-Germanic *glaðo- (“‘smooth’”), from Proto-Indo-European. Cognate with Old High German glat (“‘smooth’”) (German glatt (“‘smooth’”), Old Norse glaðr (“‘smooth; happy’”), Old Bulgarian: гладък (gladak) (“‘smooth’”). Another theory suggests the word perhaps is akin to clades and cardo. A sword of the Cogotas II culture in Spain, which began about 700 BC. The shape is indistinguishable from the gladius hispanus. The Hispanic sword was probably not acquired from Hispania and not from the Carthaginians. Livy relates the story of Titus Manlius Torquatus taking up a Gallic challenge to a single combat by a large-size soldier at a bridge over the Anio river, where the Gauls and the Romans were encamped on opposite sides of the river. Manlius strapped on the Hispanic sword (Gladius Hispanus). During the combat he thrust twice with it under the shield of the Gaul, dealing fatal blows to the abdomen. He then removed the Gaul's torc and placed it around his own neck, hence the name, torquatus. The combat happened in the consulships of C. Sulpicius and C. Licinius in about 361 BC, much before the Punic Wars, but during the frontier wars with the Gauls (366-341 BC). One theory therefore proposes the borrowing of the word gladius from *kladi- during this period, relying on the principle that k becomes g in Latin only in loans. Ennius attests the word. Gladius may have replaced ensis, which in the literary periods was used mainly by the poets. The debate on the origin of the gladius Hispanus continues. That it descended ultimately from Celtic swords of the La Tene and Hallstat periods is unquestioned. Whether it did so directly from Celtiberian troops of the Punic Wars or through Gallic troops of the Gallic Wars remains the question of the Hispanic sword. The gladiator generally was a slave (more rarely a free volunteer) who fought to the death using a gladius in a display called a ludus, "game"—in origin held as part of the funeral celebration in honor of a notable warrior. The time the custom began is lost in the prehistoric Bronze Age. Etruscans held funeral ludi of an unknown provenance. They passed the custom on to the Romans. In Roman gladiatorial theory, prisoners of war were to be sacrificed as a duty to the deceased warrior; hence the games were called munera, "services." Over the centuries, services were rendered through many forms of combat. The sacrificed went by many names. Even among the Romans, combat and weapons were of many forms. That being so, the choice of the word gladius needs to be explained. It must have been appropriate when displays began at Rome. Games were held first by Latin speakers at Capua, a renamed Etruscan city. Livy explains that in 308 BC the Samnites were defeated by the Campanians, who captured a large cache of new and ornate arms, only acquired by the Samnites in 310 BC. The Campanians gave these to their gladiators, innovating a new class of gladiator, the Samnites. They fought with the gladius. When the Romans instituted the games at Rome in 264 BC, they displayed 3 pairs of matched gladiators. They were probably called gladiators then, though the only evidence is Livy's word for it. He may have been speaking anachronistically; however, his description of the Gallic combat above matches the use of the gladius. The dates 139B.C.-25A.D., certainly, are right. In that same year, the Punic Wars began. By the time of the Roman Republic, which flourished during the Iron Age, the classical world was well-acquainted with steel and the steel-making process. Pure iron is relatively soft, but pure iron is never found in nature. Natural iron ore contains various impurities in solid solution, which harden the reduced metal by producing irregular-shaped metallic crystals. The Chalybes of the Caucasus region were metallurgists for Iron-Age Europe and they had found that increasing carbon content produced harder steel. In Roman times ore was reduced in a bloomery furnace, as the blast furnace had not yet been invented, at least in western society. The temperature did not become high enough to actually melt the metal. The resulting pieces were called blooms, which were further worked to remove slag inclusions from its porous surface. A recent metallurgical study of two Etruria swords, one in the form of a Greek kopis from 7th century BC Vetulonia, and one in the form of a gladius Hispaniensis from 4th century BC Chiusa, gives some insight concerning the manufacture of Roman swords. The Chiusa sword comes from Romanized Etruria; thus, regardless of the names of the forms (which the authors do not identify), the authors believe the process was continuous from the Etruscans to the Romans. The Vetulonian sword was crafted by the pattern welding process from five blooms reduced at a temperature of 1163 °C. Five strips of varying carbon content were created. A central core of the sword contained the highest: 0.15–0.25% carbon. On its edges were placed four strips of low-carbon steel, 0.05–0.07%, and the whole thing was welded together by forging on the pattern of hammer blows. A blow increased the temperature sufficiently to produce a friction weld at that spot. Forging continued until the steel was cold, producing some central annealing. The sword was 58 cm (22.8 in) long. The Chiusian sword was created from a single bloom by forging from a temperature of 1237 °C. The carbon content increased from 0.05–0.08% at the back side of the sword to 0.35–0.4% on the blade, from which the authors deduce some form of carburization may have been used. The sword was 40 cm (15.7 in) long and was characterized by a wasp-waist close to the hilt. Roman swords continued to be forged both as composites and from single pieces. Inclusions of sand and rust weakened the two swords of the study and no doubt limited the strength of swords during the Roman period. Gladii were two-edged for cutting and had a tapered point for stabbing during thrusting. A solid grip was provided by a knobbed hilt added on, possibly with ridges for the fingers. Blade strength was achieved by welding together strips, in which case the sword had a channel down the center, or by fashioning a single piece of high-carbon steel, rhomboidal in cross-section. The owner's name was often engraved or punched on the blade. Stabbing was a very efficient technique, as stabbing wounds, especially in the abdominal area, were almost always deadly (see the quotation from Vegetius under pugio). However, the gladius in some circumstances was used for cutting or slashing, as is indicated by Livy's account of the Macedonian Wars, wherein the Macedonian soldiers were horrified to see dismembered bodies. The gladius was sheathed in a scabbard mounted on a belt or shoulder strap, some say on the right, some say on the left (refer to the articles cited in the notes). Some say the soldier reached across his body to draw it, and others affirm that the position of the shield made this method of drawing impossible. A centurion wore it on the opposite side as a mark of distinction. Towards the end of the 2nd century A.D. the spatha took the place of the gladius in the Roman legions. Several different designs were used; among collectors and historical reenactors, the three primary kinds are known as the Mainz gladius, the Fulham gladius, and the Pompeii gladius (these names refer to where or how the canonical example was found). More recent archaeological finds have uncovered an earlier version, the Gladius Hispaniensis ("Hispanic sword"). The differences between these varieties are subtle. The original Hispanic sword, had a slight "wasp-waist" or "leaf-blade" curvature. It was used in the republic. The Mainz variety came into use on the frontier in the early empire. It kept the curvature, but shortened and widened the blade and made the point triangular. At home the less battle-effective Pompei version came into use. It eliminated the curvature, lengthened the blade, and diminished the point. The Fulham was a compromise, with straight edges and a long point. * Gladius Hispaniensis: Used from no later than 200 B.C. until 20 B.C. Blade length ~60–68 cm. Sword length ~75–85 cm. Sword width ~5 cm. This was the largest and heaviest of the gladii. Earliest and longest blade of the gladii, pronounced leaf-shape compared to the other forms. Max weight ~1 kg for the largest versions, most likely a standard example would weigh ~900g(wooden hilt). * Fulham or Mainz-Fulham: The sword that gave the name to the type was dredged from the Thames near Fulham and must therefore date to a time after the Roman occupation of Britain began. That would have been after the invasion of Aulus Plautius in 43 AD. It was used until the end of the same century. It is considered the conjunction point between Mainz and Pompei. Some consider it an evolution or the same as the Mainz type. The blade is slightly more narrow than the Mainz variety, main difference is the triangular tip. Blade length ~50–55 cm. Sword length ~65–70 cm. Blade width ~6 cm. Sword weight ~700g(wooden hilt). 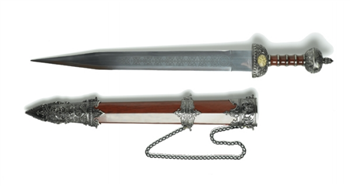 * Pompei (or Pompeianus or Pompeii): Named by moderns after the Roman town of Pompeii, this Gladius was by far the most popular one. Four instances of the sword type were found in Pompeii, with others turning up elsewhere. The sword has parallel cutting edges and a triangular tip. This is the shortest of the gladii. Observe that it is often confused with the spatha which was a longer, slashing weapon used by the auxilia from horseback. Over the years the pompei got longer, these later versions are referred to as semi-spathas. Blade length ~45–50 cm. Sword length ~60–65 cm. Blade width ~5 cm. Sword weight ~700g(wooden hilt). » Welcome to the new Roman Forum!